HELLO ALL! 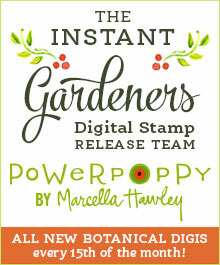 How about starting off the day with a new digital release from Power Poppy! This one is titled Snowdrops and Tea Roses and the digital download also includes a no line version of this stunning arrangement of roses, snowdrops and holly as well as two merry sentiments. The first in a series of bouquets nestled inside vintage French café au lait bowls. Festive enough for Christmas cards; cozy enough for a winter’s afternoon coloring session. This scene features a trio of hybrid tea roses arranged with crisp white snowdrops and variegated holly. Be open and adventurous with your coloring, ie: berries can be white/pink/light green if you are using red roses. Holly doesn’t always have to be red. Remember, we are making the picture, nature is just one of our inspirations. A few tea rose varieties to use as inspirations to make this bouquet especially festive: ‘Bewitched’ (pale pink), ‘Neil Diamond’ (red-and-white streaked), ‘Cinnamon Dolce’ (dark red with pink streaks), ‘Gemini’ (creamy center with coral pink edges), ‘World War II Memorial Rose’ (light pink with tinges of red). I was short on time so I knew that I had to keep my card design simple because there just wasn’t time to do anything too elaborate. I printed my image and sentiment on X-Press It Blending Card and die cut the shape so that I could gauge size of the background. When I was ready to color, I started with the roses and the rest of the color scheme evolved from there. I hadn’t planned on coloring the background, but the colors of the floral elements were so soft that the background needed a bit of a punch. Although I know I should do the background first, I ended up adding it (carefully!) at the end. This seems happens to me all the time so I have a lot of practice in inserting a background after the fact. But I’m very visual, so sometimes I don’t really know where I’m going until I start putting ink on the paper. Although this digital stamp set includes two sentiments, I decided to use the sentiment from Power Poppy’s Chickadee in Barberry, a digital set that is a personal favorite of mine. For the card base, I blended two shades of Distress Inks — Worn Lipstick and Picked Raspberry — to create a contrasting edge. There’s plenty of inspiration from the Instant Gardeners this month so be sure you stop by and see what they have in store for you! Very pretty, loved your bowl and background color choices. Great job Nancy! This is gorgeous, Nancy! I noticed your background before I studied the rest of the card. Love your creativity and coloring!